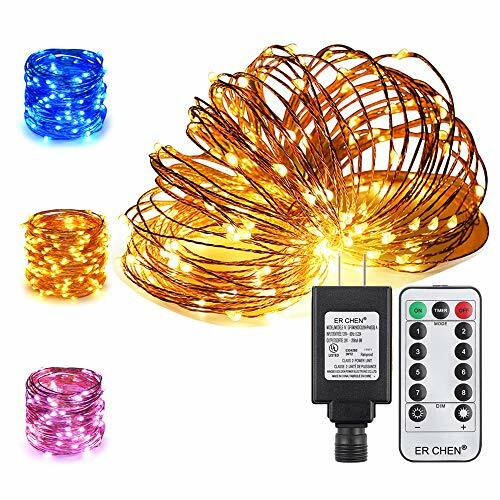 ER CHEN Color Changing LED String Lights Plug in with Remote, 39.5ft 100 LED Copper Wire Dimmable Fairy Lights 8 Modes Decorative Lights with Timer for Bedroom, Patio, Garden, Yard－Warm White&Blue by ErChen at Defy Now. MPN: ED0315L. Hurry! Limited time offer. Offer valid only while supplies last. Dual-Color LED Bulb: This patent protected led string light made by Dual-Color Leds. Each mini Led bulb contain two different colors which can Light up alone or together. This feature make the string light can light up in 3 different colors. (Warm white, Blue, the combination of warm white and blue.). 100 Dual-color LEDs on 33ft/10m copper wire, the 6.5ft /2m long lead wire offers more choices for the placement of light strings. Wonderful Remote Control: 8 light mode include: Steady on 3 different colors, color alternate in slow fade, color transforming, color changing in flash and so on. 10 brightness levels provide fine adjustment, even got smart timer function to automatically have lights stay 6h on and 18h off. Set timer up properly, you will have a warm glittering shinning "welcome home"! Supplied Switch for All Output Modes: Remote is no more the only key to light up the lights! There's a little silicon covered button on the white IR controller, Press it to get all the light modes if you can't find your remote. Certification and Warranty: High-safety power adapter is guaranteed with UL certification, and the dual-color LED string lights possess FCC and CE certificates and passed UL 588 certification for safer usage. We provide you with 12 months' warranty, 60 days Money Guarantee, 24hrs Customer Service. If you are not satisfied with the product, please don't hesitate to contact us in any time, we are always happy to help you. If you have any questions about this product by ErChen, contact us by completing and submitting the form below. If you are looking for a specif part number, please include it with your message.